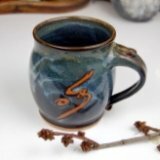 Handmade pottery adds the perfect touch to any kitchen. A pottery kitchen canister set stoneware style offers the convenience of storing dry food where it is easily accessible. In the photo on the left is a kitchen canister in the ceramic greenware stage. They are fairly simple to make and go nicely on the kitchen counter next to a coffee mug tree full of large coffee mugs. They just require the patience to measure accurately so the lids fit well. 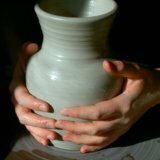 Stoneware simply refers to the type of pottery clay used, which is a high fire clay. It's very durable and water tight. Ready to learn how to make a kitchen canister set? Making a canister body is pretty straight-forward. For a small canister, use a ball of clay the size of two fists or a cantaloupe. Throw a basic cylinder with straight walls. It should be taller than it is wide. Leave extra clay at the rim so you can create a seat where the lid will rest. To form a seat, flatten the inside half of the rim. Create a 1cm horizontal shelf and a 1cm vertical wall on the outside. You can do this with a finger or the corner of a pottery rib. Support the rim with your other hand so it doesn't collapse. Measure the opening of your jar with calipers or a ruler (see photo at right). Tip: Be sure to measure immediately after throwing. This is important, because as it dries it will shrink, which will throw off you measurements. 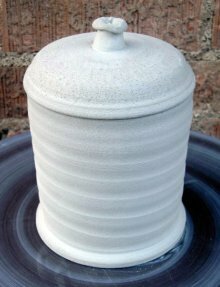 Getting a tight fitting lid is the real challenge to making a pottery kitchen canister set. 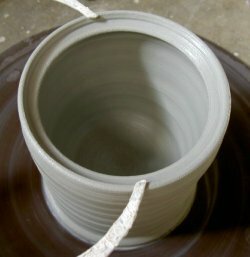 First, using about a third of the clay used in the jar, throw a shallow bowl. Later, you'll turn the bowl upside down to create your lid. 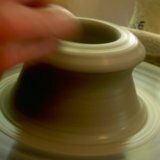 You can leave a little extra clay on the bottom to be trimmed off later. Measure the rim of your lid so it matches the measurements of your jar (see photo). Measure it so that it will nest just inside the outer lip of the rim on the jar . 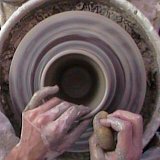 Finally, dry your lid to leather hard, turn it over, and trim the excess clay off the top. Add a handle using some slip. 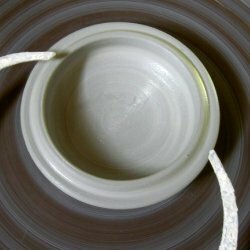 It can be a simple knob made from a ball of clay, or a hand-pulled strap. Check the fit of your lid to ensure the measurements are correct. Tip: If it doesn't fit, you can throw another lid for the same canister, adjusting the new one to fit the original measurements. To make an entire pottery kitchen canister set in stoneware, make additional jars of gradually increasing size. Sets generally range from three to seven jars. Also try mini jars for holding sugar and spices. Thanks for learning, and Happy Potting.